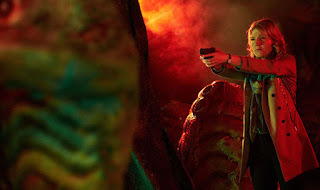 In “The Zygon Invasion”/“The Zygon Inversion” (2015) the Doctor and companion Clara encounter the Zygons, shape-shifting aliens who settled on Earth in the wake of the events chronicled in the show’s 50th anniversary special, “The Day of the Doctor” (2013). They take human form and live out their lives peacefully on Earth in human guise, and are particularly concentrated within the United Kingdom. The plot involves a group of Zygons which becomes “radicalised” and kills the existing Zygon leadership. 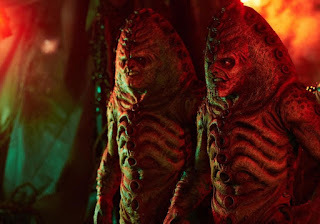 Its grievance appears to be that Zygons want “the right to be themselves”. The Doctor’s anti-war stance turns “The Zygon Invasion”/“The Zygon Inversion” into rather a sharp political satire. It was broadcast around the time that the British House of Commons was deciding whether to bomb Syria as part of Britain’s efforts against the so-called Islamic State group. The idea that bombing would win recruits to the extremist group was a major argument against intervention. But the Syria bombing was of course no flash in the pan: it followed British military action in Afghanistan, Iraq and Libya, which were likewise none-too-successful in ending conflict. One can therefore view “The Zygon Invasion”/“The Zygon Inversion” as a satire on the country’s foreign policy as a whole. Ultimately the Doctor prevents UNIT from using “Sullivan gas” which would kill the Zygons, and, with some impressive anti-war rhetoric, he manages to convince the leader of the rebel Zygons to accept the way of peace. He reinstates his friend Osgood and her Zygon counterpart as guardians of the peace, with the tantalising suggestion that “the Osgoods” are neither human nor Zygon but somehow a hybrid between the two species. The flaw in the story is that conflicts don't tend to end this way. Usually the side which has a grievance obtains some concessions, even if these concessions are far removed from what they originally sought. An example would be the Irish Republican Army in Northern Ireland, which craves a united Ireland but settled for a power-sharing constitution in Northern Ireland as the price for peace. 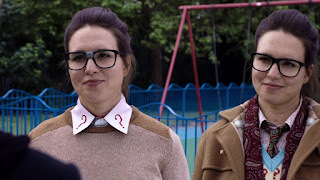 “The Zygon Invasion”/“The Zygon Inversion” falls down somewhat because it does not interrogate the Zygons’ grievance, nor does the Doctor offer them anything beyond the status quo ante, not even a fig leaf. Danny Nicol is a British socialist and a professor of law.